Hi friends in the another post, we have discussed about types of dies used for manufacturing. Basically the types of dies depends on the type of operation in the press machine. So we will discuss the type of operations in the sheet metal component by press machine. There are many operations which can be performed in the sheet metal. They are divided in the two categories i.e. 1) cutting operations 2) non cutting operations or Forming Operation. This is one of the cutting process. In which the punch tool is imposed or pressed in a specimen to cut the material. 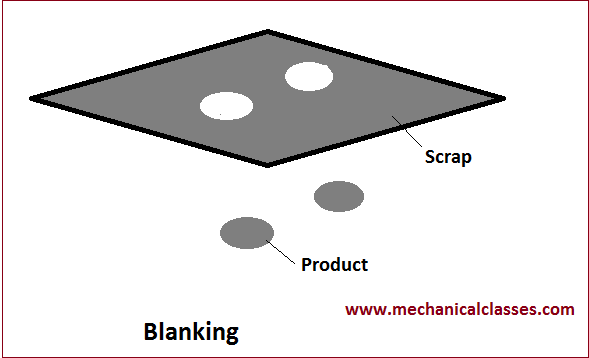 In blanking the punched part will be the useful product and the remaining will be the scrap part. This is same process as blanking. In this process the holes are cut by press machine. But in piercing the punched part will be the scrap and remaining would be useful product. In the notching process the material is removed from the edges of the specimen. The press is applied and scrap is removed by cutting action from the edge of the work piece. In this cutting process material is removed from one specimen to make two useful products by cutting action. In this cutting process the material is not removed totally from the specimen. In a rectangular cut three side cutting operation is done. The remaining side is used for bending. If the cutting action is done along a line, it is simply referred as cut off. In this cutting process, maximum holes are tried to cut in a single stroke of press. This is a kind of piercing process to cut maximum holes. This is cutting action to control the movement of the strip. In this process the successive holes are created by punching. The required size of sheet is created through punching. This is done when the die to cut the sheet is not available or the size of required product is large. This process can also be done by drilling the holes in the specimen. This process in consist of cutting and forming process. In this one edge is operated with cutting action and three edges are cut by forming operation. This process is to remove the extra unwanted material from a drawn component. This is a finishing operation to be performed on the blanked or pierced parts. In this operation the sheet metal is pressed to bend at an angle. The bending tool is designed to fix a certain bending angle for mass production. Embossing is the process of producing a shallow forming of identical thickness. It is process of changing the blanked part into hollow vessel. 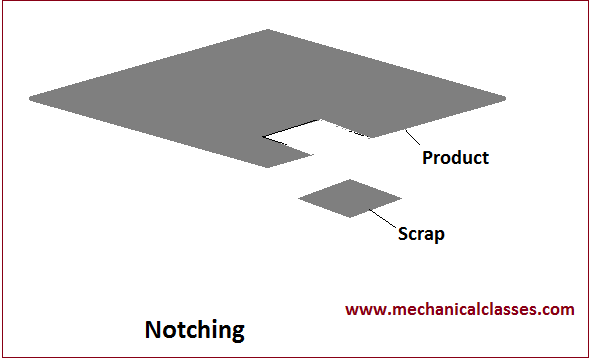 This definition is regarding sheet metal because Drawing is also a forming operation. Process of making impressions and/or depressions in the specimen by press machine tool is called coining. It is a process to insert a text on the surface of metal sheet. If someone want to write something on the metal sheet, this process is used. The tool will press the metal to dig out a text. In this the height of a cup shaped component is decreased. This happens due to the expansion of cup along a narrow band. This is the process of forcing the material along to the periphery of a hollow cylinder. It is the process to turn the edge inside to a segment. It is a process to join the two sheets of metal by interlock them with each other. Sheet metal industry is very big in the field of manufacturing. Most automobile parts are of sheet metal. So every mechanical geek should know about these operations. These are the cutting and forming processes performed in press machine shop in press tool. these operation in largely used in Automobile industry. This is all about this post if you want to ask something, please let me know in the comment section. If you have some additional information about this post then please mention it in the comment. Great training for those who need such knowledge. I like this.